The trail led from a procedural question over the ordination of a deacon – which Wimer became, before becoming a priest – to a realisation that he would have loved the deaconate, because of its association with the Gospels, and the Deacon’s role in reading the Gospels to the people. He would also have hated the requirement to sing part of the sermon, so would have wanted to become a priest as soon as possible! Then I moved on to his ordination as a priest, and discovered as part of the reading around that, the requirement for every Catholic altar to have within it a relic from a saint – preferably a martyr. This holds to this day, which I am amazed by. And then discovered the right saint. Meet St Walstan, the Saxon-born patron saint of crops, healer of animals. 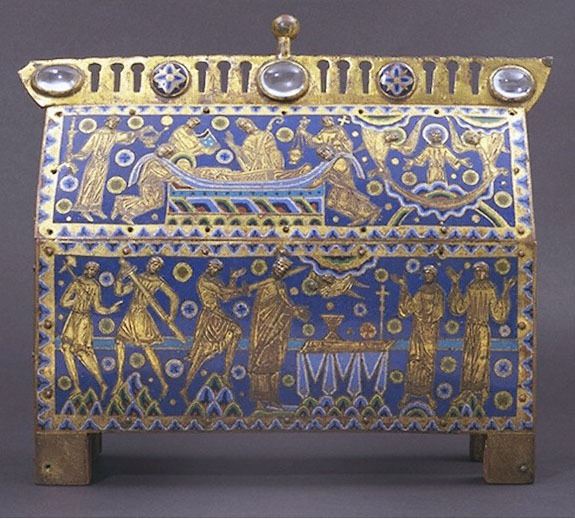 This is beginning to come together… I’ve now stopped trawling the web for images of reliquaries, and am off to write the scene when he discovers the right reliquary for his Priory-to-be!